Abraham Lincoln is perhaps our most storied president. Of course one of the most legendary aspects of Lincoln is, alas, his assassination. From the shooting in Ford's Theatre, to the fact that his killer was an actor, to the place of the murder in national history and lore, this murder is, among other things, the stuff of theater. 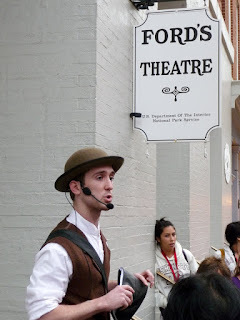 It's only fitting, then, that Ford's Theatre would memorialize Lincoln in a walking tour that takes participants back to the time following the assassination. In this episode of the podcast, you'll hear segments from the walking tour, and a bit of conversation with actor Matthew McGloin, who led the tour when I went on it last year, the bicentennial of Lincoln's birth. (The above photo of Matt in character is by Mark Ramont.) The tour is called "Investigation: Detective McDevitt," and was written by Richard Hellesen. For more on this and another Ford's tour called "A Free Black Woman: Elizabeth Keckly," click here. Btw, Ford's is still a working theatre, with a mission to celebrate the legacy of Abraham Lincoln and to explore the American experience through theatre and education. The box where Lincoln and his wife Mary Todd were seated on April 14, 1865 has been cordoned off, and is draped with flags. There is Lincoln memorabilia in the lower level of the theatre. Here's the current season of shows, and here's a cool virtual tour of the theatre, with click and drag panorama photos of the interior.